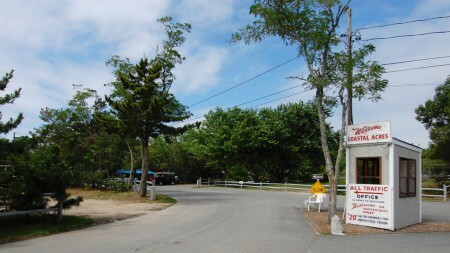 76R Bayberry Avenue, entrance to Coastal Acres Camping Court, by David W. Dunlap (2008). F/V Silver Mink, by David Jarrett (1982). “In the Shelter of Cape Cod’s Sandy Arm — Your Port o’ Call.” The motto of the Coastal Acres Camping Court has the pleasingly anachronistic ring of a place that’s endured the changing fashions of Cape-end vacation styles. It was developed by Capt. Manny Phillips, a towering figure of the fishery. His purse seiner, Silver Mink, brought in a record 250,000 pounds of tuna one day in 1959. Captain Phillips opened the 15-acre campsite in 1967 and sold Silver Mink. His son-in-law, Richard Perry, took over Coastal Acres, which is still family-run. Open-space advocates say the property, now more than 23 acres, is the largest undeveloped parcel in town. Update | “Jamie Veara, a spokesperson for the trust that owns the Coastal Acres campground in the West End, told The Banner on Tuesday morning that the property is under contract. The transaction involves two parcels on a 22-plus-acre site, which had been listed at $4.5 million.” — The Provincetown Banner, 15 October 2015.